Greek demonstrators have taken over the Finance Ministry building in Athens and blocked streets in the city centre in protest against the government’s plan to cut the deficit, according to media reports. Bloomberg reports that this is just the beginning. More protests and strikes—including a three hour work stoppage by the main union for public workers, is set for tomorrow. 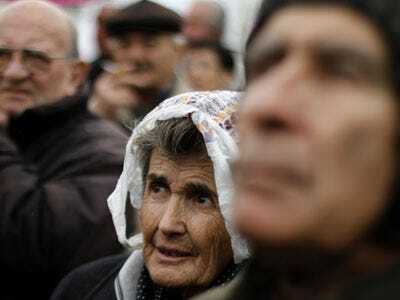 This mass resistance coming from government workers is likely to hurt efforts by Greek Prime Minister George Panandreou to convince European Union allies and investors that he can get his country’s budget under control. The Germans and the French are no doubt watching the events on the streets of Athens very closely. Today’s takeover of the finance ministry building was organised by a union group aligned with the Greek Communist party. Other protestors have taken over the nearby General Accounting Office, Bloomberg reports. Yet another group is blocking a central road in downtown Athens.